After the disastrous events of the Second World War science only slowly recovered within Europe. Allergy or immunology had not been an established and recognized discipline before the war in spite of many outstanding and excellent researchers and scientists in this field. Many of them had been forced to emigrate due to the nationalsocialist terror regime. Among others e.g. the famous Carl Prausnitz from Vienna who had discovered that the immediate type allergic hypersensitivity can be transferred by serum into another individual of same species; also Paul Kallós had been forced to emigrate from Hungary via Germany to Sweden. The various fields of medicine recovered from the crises at different paces; allergy and immunology were not among the first disciplines to be established firmly very soon. Rather this field was newly emerging out of many different disciplines trying to find its shape and structure both in experimental research as well as in clinical practice. 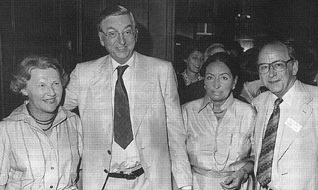 Erich and Margret Fuchs with Alain and Christine de Weck. This was reflected by the formation of a couple of national and international associations who were calling themselves Society for "Allergy" "Allergology" or "Allergy and Clinical Immunology" or "Allergy and Immunity Research" and others. In 1951 the "International Association of Allergy and Clinical Immunology" (IAACI) was founded, shortly there after the "European Academy of Allergology and Clinical Immunology" (EAACI). Naturally behind these newly formed associations distinct personalities were standing, and - equally naturally - there was some antagonism between some of these powerful figures. Within Scandinavia it was Bruun who had the strongest influence on the foundation of the EAACI. The clinical immunologist and allergist Paul Kallós felt strongly that between these rather large international societies of the European and the International association there was a need for a more intense connection between leaders in the field. Therefore first contacts were made between various countries, not only in Europe, however, with a rather strong European participation and from various medical and biological disciplines. The minutes of October 15, 1954 show the founding of the Collegium Internationale Allergologicum (soon known under the acronym of "CIA"). In the city of London 48 very distinguished physicians and scientists from 18 countries of all continents and from very different fields of medicine and biological research gathered in London to sign the inaugural document. Regarding the origin of the founder members the majority was Anglo-Saxon (ten persons from the United Kingdom, seven persons from the USA, three from Australia). Among the continental European countries Italy and Switzerland (six members each) were followed by Sweden (three members) and France (two members). The rest of the world, including Latin-America (Sao Paulo), Africa (Johannisburg) and Asia (Kyoto) were represented by one member. Among the founder members we find a remarkable row of famous personalities in medicine and in the emerging field of allergo-immunology: Daniel Bovet, R.R.A. Coombs, Sir Henry Dale, Carl Prausnitz-Giles, Karl Hansen, Elvin Kabat, Paul and Liselotte Kallós, W. Kaufman, W. Löffler, E. Mayer, Guido Miescher, Zoltan Ovary, B.M.B. Riley, Hans Selye, Ugo Serafini, J. Waldenstroem, just to name some of them. They were indeed world-known figures who have contributed fundamentally to the development of allergology and immunology research in our century. It was not fortuitous that the acronym for the Collegium Internationale Allergologicum was "CIA". From the beginning, the collegium was considered to be a somewhat exclusive club of friends. Right at the outset the membership of the Collegium was limited (max. of 200 living members worldwide until 1986, when it was enlarged to 250). New members only can be inducted at the invitation by a CIA member. Before a new member will be selected, he or she has to attend at least one symposium as active participant and present some of the own original research work. By this policy it was possible that the collegium attracted the majority of the really active people in the field. "The Collegium is an international group for the study of scientific and clinical problems in allergy and related branches of medicine and immunology. The collegium aims to promote the humble spirit of scientific enquiry, friendly cooperation, good fellowship and professional relationships in the field of allergy"
The collegium was planned and handled in a way that it should be free of power politics and non-scientific influences. It should gather a club of friends sharing the common pursuit of excellence in research in a spirit of free intellectual exchange. It could conduct its affairs with a minimum of formality and bureaucracy. All this was handled in an excellent way by the founding member Paul Kallós, to whom this collegium owes a lot. These aims and characteristics, fortunately, have remained valid up to now. This was only possible by the minds and hands of very diligent an enthusiastic officers, first of all the presidents Harley, West, Milgrom, K. Ishizaka, Sehon, de Weck and Lichtenstein. But also the secretaries did a lot of work and exerted some influence behind the scenes under the chancing titles of "executive", "honorary" or "general Secretary". It can clearly be stated here that it was the effort of Paul Kallós (honorary secretary from 1954-1974) who conducted and managed the affairs of the collegium with utmost diplomacy and humanity, so that his successors had an excellent guideline and at the same time a hard challenge to follow and keep up the tradition until today. The over 70 different and - in a four-year-rhythm changing-members of the Council in the history of the CIA reflect the interdisciplinary and mixed geographic character of this international group. According to the statutes honorary members can be elected, who have the extraordinary respect of their peers for special scientific contributions. When honorary members are still active at the time of election they are called according to definition "life members"
The foremost and the almost sole activity of the CIA is the organisation of very special scientific meetings. This tradition already started with the first meeting in London in 1954 organized by Paul Kallós and David Harley. These CIA symposia have been organized almost every other year during the last forty years and will take place for the 21st time in September 1996 in Fuschl/Salzburg. All of these symposia can be regarded as milestones in not only CIA but sometimes also allergy history. The dates, sites and organizers of the CIA symposia are enlisted in table 2. In our days, when accelerating scientific developments and expanding medical research are leading to a proliferation of scientific meetings, more or less influenced by big business and characterized by a hectic gathering of innumerable people measured in thousands, the CIA symposia have always been characterized by a unique atmosphere of colleaguality. At the same time they have remained focus on the vanguard of allergy research, maintaining the highest international standards of scholarship. This was - last but not least - only possible by the limitation of the size of these symposia (rarely exceeding 150 participants). Looking through the programs, the highlights of the discoveries in allergy research are almost all represented: Mast cell physiology and histamine release, basic immunology with the discovery of T cells and later T cell populations. Immunoglobulin-E and immunoglobulin-E regulation, complement activation, parasite defense, discovery of new mediators such as platelet activating factor (PAF) (the attendants of the Konstanz meeting probably will not forget so easily the discussion between J. Benveniste and N. Pinckard), the final identification of slow reacting substance of anaphylaxis (SRS-A) as a group of leukotrienes, mast cell heterogeneity, psychoneuroimmunology, immunodeficiency (equally memorable was the peaceful coordinate session with R. Gallo and L. Montagnier in Göteborg), clinical allergy from all fields and including all kinds of new therapeutic modalities. The proceedings of all these symposia have been published in an illustrious series of monographs or supplements to the "International Archives of Allergy and applied Immunology". Sometimes, the CIA was lucky enough to invite speakers for special subjects who shortly thereafter were awarded with the Noble prize (e.g. B. Samuelsson, E. Neher). The history of the scientific contributions to the CIA symposia also reflects the changing fashions in the field, when in the seventies eosinophils were regarded to be the carriers of anti-inflammatory activity by their mediator degrading enzymes, the picture has changed totally now showing us the eosinophil as a very active proinflammatory cell. In spite of the remarkable progress in the field, many of the problems of our ancestorie have not been solved in the last fourty years. The mechanism and nature of so called pseudo-allergic reactions (a term propagated mostly by Paul Kallós) is still largely unknown. Equally, the traditional therapy of hyposensitization is still waiting for the final breakthrough with regard to efficacy and safety. Attempts to induce immunological tolerance in the human system or in ongoing sensitization have so far been experimental in nature and not become clinical routine. Anyone who has ever attended a CIA symposium knows that these meetings are characterized by an atmosphere of intimacy conducive to personal contacts and to establishing new friendships. This is not only due to the high quality of the scientific program but also to the fact that most of those attending are well beyond the starting point in their scientific careers and feel comfortable to engage in debates in a more relaxed and informal environment. The site of each CIA meeting is also chosen so as to be conductive to some (limited in time!) social activities. Traditionally the symposia have been held in attractive and some isolated locations in order to keep the people together after the sessions and in the free time for relaxed communication. Naturally this goal can be achieved most easily on an island or at least on a boat trip (preferably both should be provided at the CIA symposium). It also seems important that the location is attractive not only to the participants but also to spouses and partners. This feature has been a contributing factor over the years to the development of a "CIA-family spirit". Not infrequently these sideline activities were as memorable as the scientific program and brought people together. Since it’s establishment, the Collegium Internationale Allergologicum has lived up to these principles, traditions and aims. The elderly, prestigious group of founders has been replaced by a group of eager scientists and recognized leaders of the field. After more than forty years of existence, the CIA has become a strong and mature organisation. The future of the CIA is entrusted to a council of active researchers who are leaders in the field of immuno-allergology and proponents of growing groups of younger scientists which will ensure the continuity and vitality of the collegium.